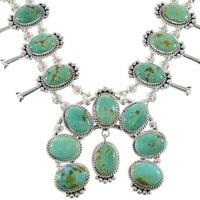 When it comes to a fine turquoise necklace, you will fall in love with our great collection. We carry one of the largest selections found anywhere, and are proud of our quality and the ability to provide the best prices possible. 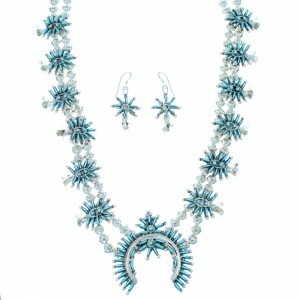 The southwest region is traditionally known for turquoise necklaces, and whether you would like a simple pendant necklace, or a large turquoise squash blossom necklace, your search is over. 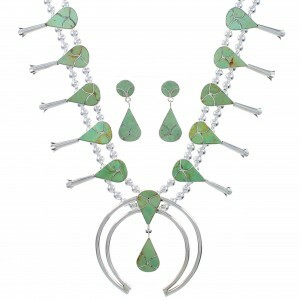 Such necklaces are an iconic emblem here in the southwest, and are a favorite among many of our Native American tribes. The Navajo and Zuni tribes, who use it in most of their traditional native jewelry, especially adore this wonderful stone. With its diverse colors from bright sky blue to a deep green, our accessories can be worn with most anything. With the bold and bright colors of spring and summer, our bright blue turquoise is extremely fashionable and adds flare and style to any wardrobe. 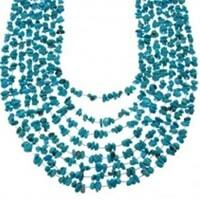 Some of our more bold turquoise necklaces are a conversation piece in itself. 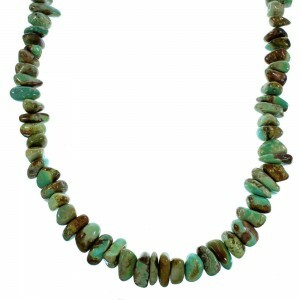 If you like one of kind items, our freeform turquoise Native American necklaces are for you. No two are exactly alike, their shape and style is as unique as the turquoise stone itself. 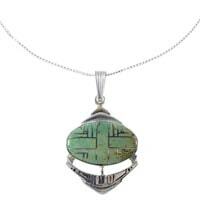 Our turquoise necklace designs come with all varieties of this beautiful stone, from all over. Some of our favorite turquoise is local to our state (Arizona), Sleeping Beauty Turquoise and Kingman are two good examples of this, Sleeping Beauty being bright sky blue and Kingman ranging from light blue to dark green with fabulous matrix. Usually the stone is named after the mine in which it comes from, that's the source of the colorful names given to the different varieties. Matrix is the most distinctive feature in turquoise stones, and is the term used to describe the veins running through the stone, these lines can range in color from red, light brown, and black. 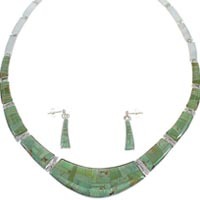 Turquoise necklace designs with an unusual matrix pattern is breathtaking, and once again will be a one of a kind piece when it is put into jewelry. 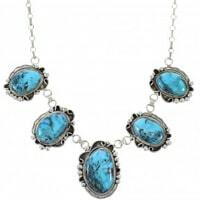 We pride ourselves on bringing you the very best turquoise Native American Necklace collection out there, at prices that make these wonderful pieces of art accessible to everyone. Native American turquoise beaded necklaces come in every style you can imagine ranging from the traditional to the more contemporary. 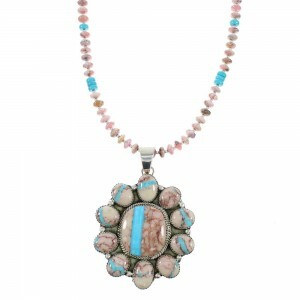 A traditional Indian turquoise necklace can come in many different styles like, turquoise Squash Blossom Necklaces, chokers, beads, and pendants with chains. 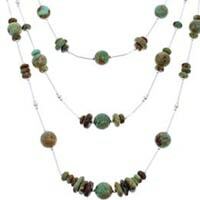 turquoise beaded necklaces are extremely popular. 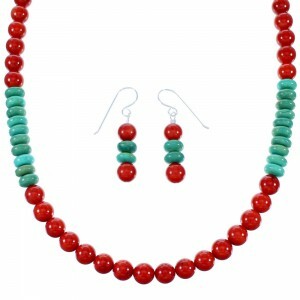 Ranging in size and shapes from a small nugget and faceted beads to large freeform nuggets or barrel shaped beads. 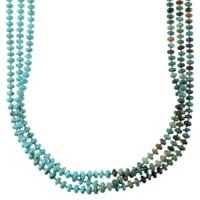 Our turquoise beaded necklaces come in single strands or multiple and graduated styles. 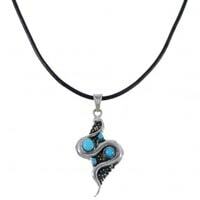 Turquoise link necklaces are also a favorite, most come with an intricate inlaid pattern. Our link necklaces are elegant and refined, some are Native American inlay necklaces others are themed stone necklaces. Whether you have a flashy style and a taste for the bolder Native American turquoise necklace, or have a more conservative disposition and would like something dainty we have the right selection for you. 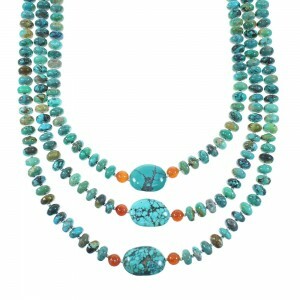 Necklaces are an essential part of everyone's wardrobe, and a turquoise necklace is no exception. Whether you need an accessory to put the finishing touch on an outfit, or you want an eye-grabbing masterpiece that cannot be ignored, we have the right selection for you. With colors varying from bright, bold, deep, and subtle, necklaces are one of the most versatile pieces of jewelry ever made. 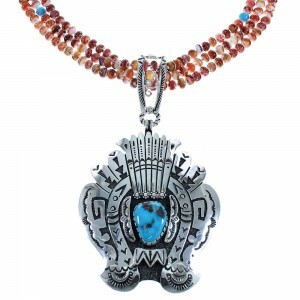 Very few companies if any carry a collection of Tuquoise Jewelry that even comes close to the size and scope of what we offer at SilverTribe, we love the fact the our Native American Indian necklaces and similar styles are such a timeless and cherished part of so many Indian jewelry and Southwest Jewelry collections. As styles continue to grow and change, we will continue to bring you the classic traditional native necklace styles along with all the new versions that come along. We will continue to bring our customers the very best quality and selection of one of the finest and intriguing pieces of jewelry every made. 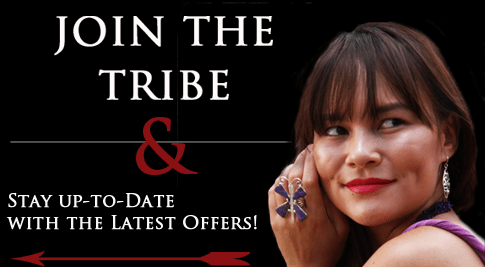 It is our mission to be you're number one Native American Jewelry vendor. We partner the best quality jewelry made with outstanding customer service using plain, simple, and honest representation of our jewelry. We know were the best, but don't just take our word for it, look through our catalog, and let us prove it to you.